It’s tough to work in parachurch ministry. It can be lonely. Many of these ministries work with transient populations like high school kids or college students who are here today, moving on tomorrow. On top of that, many churches can clash with or misunderstand the role of these ministries, neglecting them or ignoring their purpose in the community. The good news is that the Bible itself contains an example of an ideal parachurch ministry: the ministry of John the Baptist. John is this strange character, dressed in camel hair and eating locusts and honey (sound like any parachurch leaders you know! ), who comes onto the scene “mooing” like a cow in the wilderness. He is loud, brash, in your face, and yet he has appeal–especially to the marginalized sinners in Galilee. Tax collectors, fornicators, and other notorious sinners came to him in droves confessing their sins, repenting, and being baptized. For a while, John’s ministry swells. Day after day people flock into the wilderness to hear him preach, as he cries out, “Repent, for the Kingdom of Heaven is at hand!” (Matt. 3:2). He claimed to be “the voice of one crying out in the wilderness, ‘Make straight the way of the Lord'” (John 1:23). However, even as his ministry grew, he began to prepare the people to leave him: “I baptize with water, but among you stands one you do not know, even he who comes after me, the strap of whose sandal I am not worthy to untie” (John 1:26-27). We all know who this one was: Jesus. John’s response is so full of humility and purpose: “You yourselves bear me witness, that I said, ‘I am not the Christ, but I have been sent before him.’ The one who has the Bride is the Bridegroom. The friend of the Bridegroom, who stands and hears him, rejoices greatly at the Bridegroom’s voice” (John 1:28-29). John understood his place. In the Great Wedding, he wasn’t the Bridegroom, and he wasn’t gathering the Bride to himself. John was the best friend, the Best Man, who stood beside the Groom and celebrated the wedding. John was not seeking to build up his own disciple group. He was constantly seeking to give his disciples away. In the wedding metaphor he uses, he sees himself as standing beside Jesus and celebrating as the Church walks down the aisle. John saw his ministry as a funnel of sorts. He was calling men and women to repentance then seeking to funnel them into the Bride of Christ. He had no greater joy than to give his disciples away to Jesus. Multiple places in the gospels we see John intentionally sending his disciples after Jesus (John 1:35-37; Matthew 9:14-17; 11:2-6; Luke 7:18-23). This was no coincidence–this was his purpose. This is tough. It must have been tough for John to watch as all of the people who had repented began to leave him and to join Jesus’ disciples. It must have been tough to realize that Jesus was going to build his Church upon Peter and the disciples rather than on his ministry. It must have been tough as he languished forgotten in prison only to be beheaded as a bizarre birthday party trick. Jesus didn’t come to die for any parachurch ministry. He has one Bride: the Church. Whether you are John the Baptist, a traveling evangelist, an FCA leader, or any other parachurch ministry leader, you have the joy of watching as people find Jesus. The humbling part is realizing that we must find our ultimate joy in seeing those people become a part of Christ’s Bride. Only then will they participate in the Marriage Supper of the Lamb. 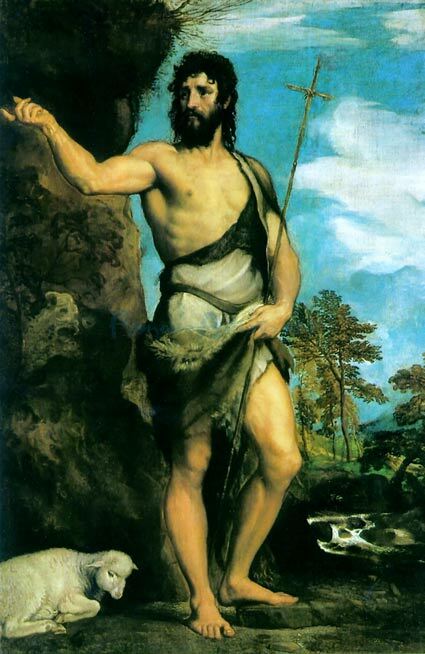 Titian’s painting of John the Baptist is perfect. Standing confidently, he extends one finger away from himself and toward the Savior, as if to say, “Don’t worry about me. I’m just here to point you to the Lamb of God who takes away the sins of the world. Turn and follow him.” May our joy be complete even as each of us discovers in our own lives that “He must increase, but I must decrease” (John 3:30). 1. John the Baptist wasn’t building the “church”. He was preparing the way for it. Once Jesus came on the scene he didn’t flow alongside him, he recognized that his purpose was fulfilled. Yes, he operated in humility, but I see him not being Para initially and then eventually funneling to Jesus. He was signaling to the world that the bride was on his way. 2. Parachurch isn’t really a biblical term. To be a part of, or to even be THE church simply means you are in Christ. Para signifies alongside, you cannot be alongside Christ. You are either in Christ, or you are not. YWAM, Youth for Christ, World Vision etc. aren’t alongside THE Church. They are either flowing in the truth of who Jesus is, and thus IN him, or they are flowing against the truth of who Jesus is and therefore are not IN him. 3. The distinction that possibly describes what scripture gives us is the separate function of Local Church, and Mobile Church. Paul was never able to personally build the Local Church, but he planted them and encouraged them to grow. He was a “missionary” in the sense that he was the Church on wheels. When these two flow in unison, it’s beautiful. When the Local expression is seen as the exclusive representation, the call to Go into all the nations can be minimized. When the Mobile expression is elevated above the Local, the call to disciple and equip the saints can be minimized. They both desperately need each other and they both serve each other. Para can often lead to thoughts of it being not legitimate or not the real deal. As well as at times the missional aspects of what can be deemed Para can feel that they are doing what the Local should do if it wasn’t so broken and apathetic. Both ways of thinking aren’t the true picture of the united Bride that Jesus gave his life for. I mean no dissent in the slightest. These are just my thoughts as I ponder this amazing topic.Thanks for posting. Feel free to dialog back if you are interested. Blessings your way from Australia. Helpful thoughts, Stevie! Thanks for reading!